First of all, many thanks to everyone for your good wishes after my recent fall. 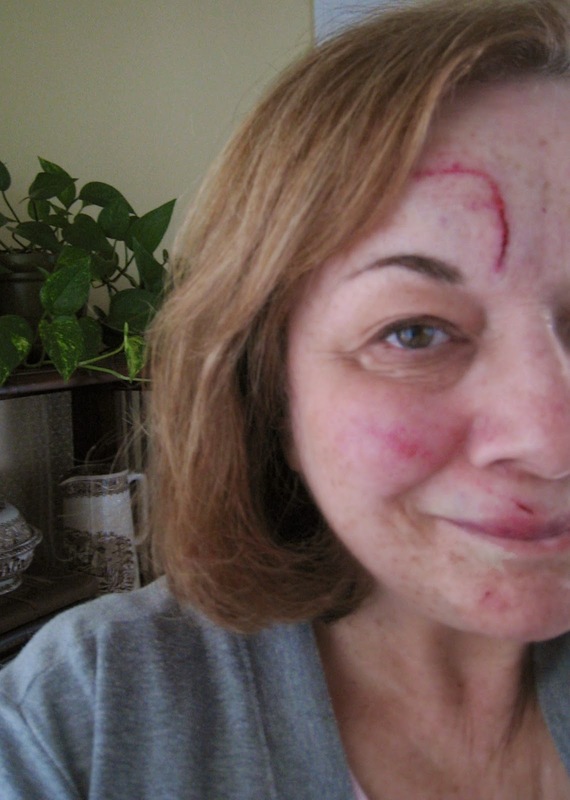 Bruises are healing and I'm feeling a bit better every day. for passages in the design that remind me of nature and elements I want to depict. with Wonder Under, which makes for a nice crisp cut. These pieces are just tossed on a background of hand painted sky fabric. and here is a hand embroidered tree which I tried recently. This technique should work well with soft grounds like wool felting. Finally, I feel like I'm making progress on my landscape-making journey!! 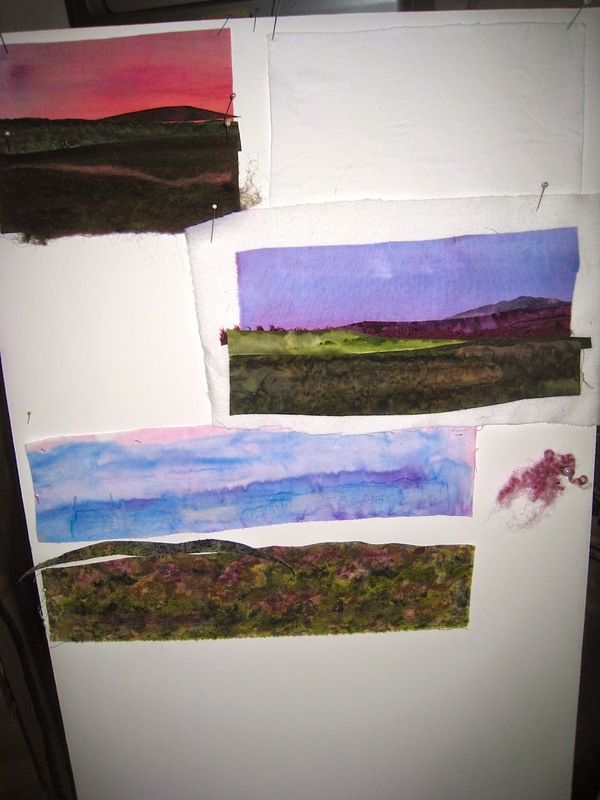 Recently I did some wet felting, making pieces of felt to add to my landscapes. them in criss-cross layers - like making lasagna! the irregular edges, which I'll put to good use! on a cement sidewalk, landing with a resounding thud of head against cement. CT scans and an Xray of my wrist. No broken bones, thank goodness. The following days brought 2 black eyes and much bruising as things developed. I won't share those pictures with you. I feel fortunate to have come out of this with not-too-serious injuries. I'm keeping a low profile and working on my artwork for the show I'll be part of, which is now a month away. I hope to share some finished work with you soon. Here's a little self portrait in felt with my furry friends. I had made it a while back, but revised it recently. Don't we look like muppets? Hope you're having a wonderful September!! I always say there's nothing like a deadline to stir up creativity, and I'm scheduled to participate in two shows this Fall, which is right around the corner! If you talked to me yesterday, you would have heard how anxious I was about this, but I feel much better today, having broken through the creative block I had been dealing with. 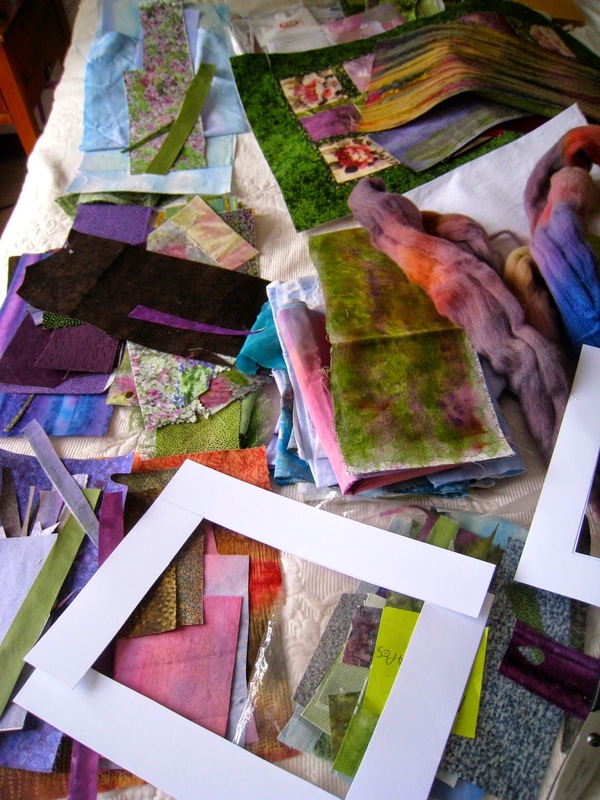 This morning, I spread out my materials - my hand painted fabrics, roving, etc. - and propped up a piece of foam board with the beginnings of some landscapes pinned to it. Here's a higher contrast photo, where you can see that I draped the dark green sheer fabric in the foreground and ironed it down, but not entirely flat. I'm happy with this technique which I had been wanting to try. I need to mull over this now and decide where to add details with roving, threads or beads. And I need to decide where and whether to add trees, so I'll just sit with it for a few days. The second landscape started with this orange/pink fabric I had painted some time ago. I really just wanted to experiment with it, but it seemed to come together pretty quickly (meaning, in about two hours with auditioning fabrics, etc) and I went out on a limb and added some bits of wool roving and hand dyed cheesecloth for texture, then finally, a setting sun. Or is it dawn? That will be up to the viewer! I'm happy to have started this journey, which will be going on until November. Thanks for reading, and hope you're having a lovely week! Now to clean up my mess for the day!!! using PicMonkey and a border I had cut from fabric years ago. the time, and also the same profile picture! seeing different headers from me all the time now! truly, we really are on a creative journey, aren't we? and cherishing every moment of the journey. 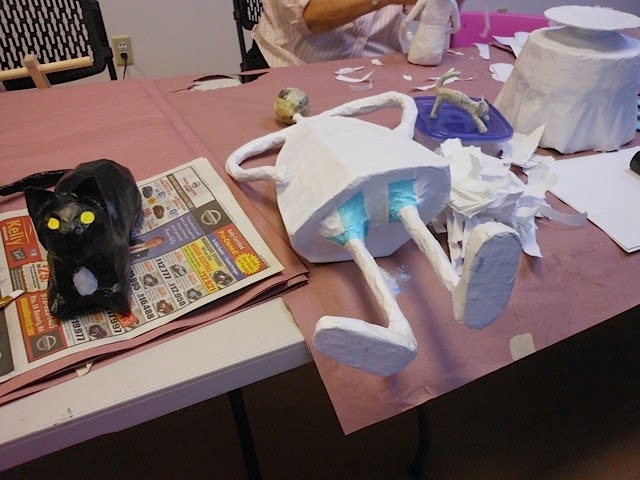 I just came across these photos my friend Andrea took a couple of weeks ago in our final paper mache class. I don't think anyone had actually completed her piece by that point, but there was progress! 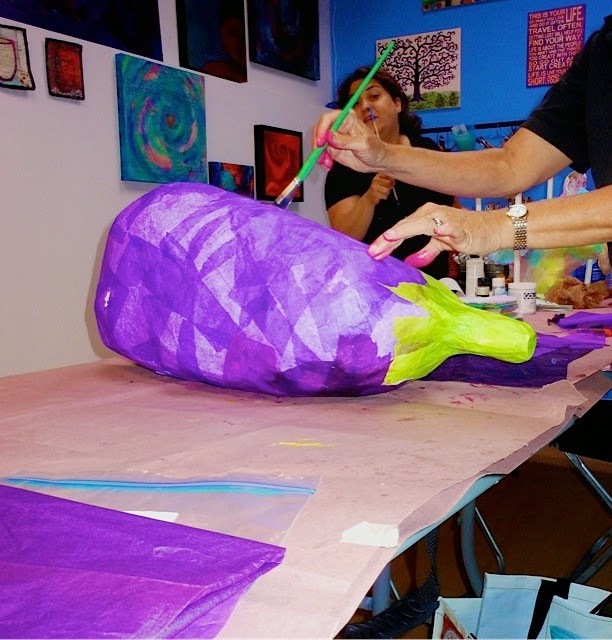 Luckily, Create Artisan Studio, the place where our classes meet, has open studio nights during which we can continue work on our projects outside of our normal class time. 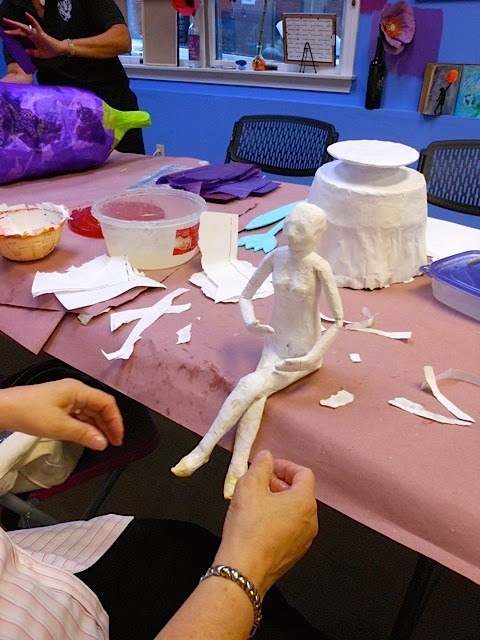 as she applies layers of tissue paper. while to her left is Barbara's black cat. since this photo was taken! 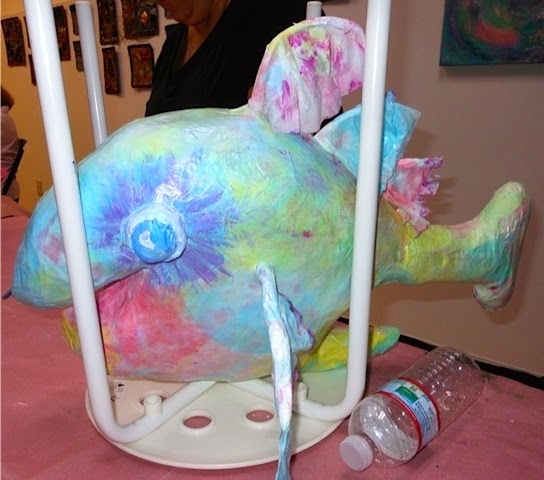 AnnMarie's fish is very happy looking! She'll be suspended from the ceiling when she's done! single file, on the back of the sofa.